The first dance. At a Saturday night wedding reception hosted by Prince Charles, the first song for the newlyweds was Whitney Houston's "I Wanna Dance With Somebody," People reports. Meghan told an interview in 2016 that the 1987 hit was her "happy song." Nephew with a knife. Tyler Dooley, Meghan's 25-year-old nephew, almost got arrested hours after the ceremony when he tried to bring a knife into a London nightclub, the Sun reports. Dooley, a marijuana farmer who lives in Oregon, gave the knife to a bouncer and fled when he was told police had been called. A witness says he claimed to have brought the knife for protection because President Trump said London was "like a war zone." More from the reception. After Prince Harry asked his guests if anybody knew how to play the piano, Elton John played four songs for the newlyweds, including "Circle of Life," Rolling Stone reports. 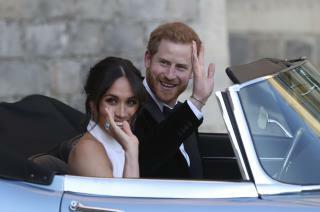 Guests, including numerous Hollywood celebrities, were banned from using their phones to record the event at Frogmore House, about a mile from Windsor Castle, which wrapped up around 2am with a fireworks display. A bouquet in a traditional spot. People reports that in a tradition which dates back to the 1923 wedding of Queen Elizabeth II's mother, Meghan's wedding bouquet was placed on the Tomb of the Unknown Soldier in Westminster Abbey on Sunday. "Proud to be a feminist." The duchess now has her own page on the official website of the British royals, the Guardian reports. It says her activism, including volunteering at soup kitchens, helped shape her "lifelong commitment to causes such as social justice and women's empowerment." The page highlights a quote from her 2015 speech to a United Nations Women's Day conference: "I am proud to be a woman and a feminist." Eh, who celebrates their birthday before the actual day? So... how many thinks it won't last? So…déclassé behavior and choices; is anyone surprised? Harry's idea of a good time is naked 8-ball in Vegas, so cheesy music and beer pong sounds right up his alley.